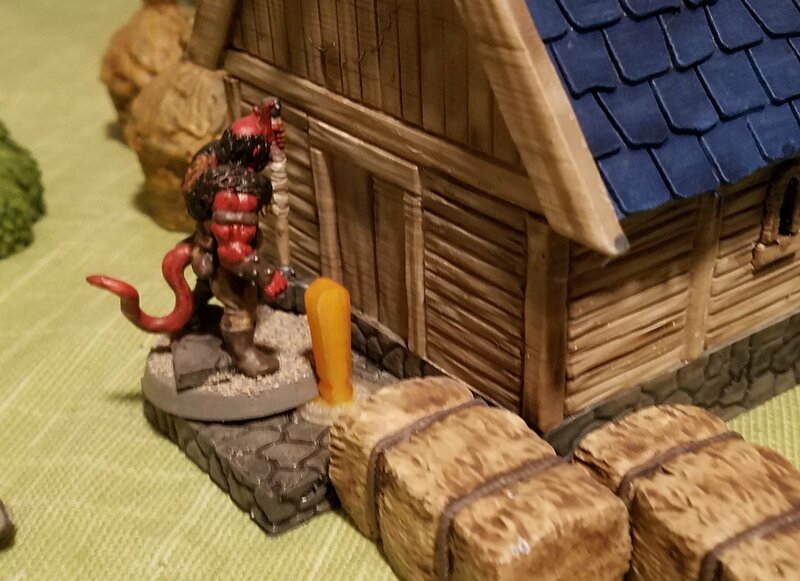 Over my "weekend", I finally put all my recent works to use and played the intro scenario, "The Missing", of Rangers of Shadow Deep as a solo game. Alexa kept me company with backup tunes. Apprentice Mik (Conjurer) a young wizard who joined the Rangers for extra credit. Hershel (Bloodhound) Cormac's longtime companion. Anwar (Archer) a pirate turned manhunter, now serving in the ranks of the Rangers in exchange for a clean slate. Cormac Wildkin (Ranger) the Half-Orc son of a renowned Elf hero. He was left at the doorstep of his father's Ranger Lodge and raised in their ways. He is a loyal member hoping to live up to his father's legacy. 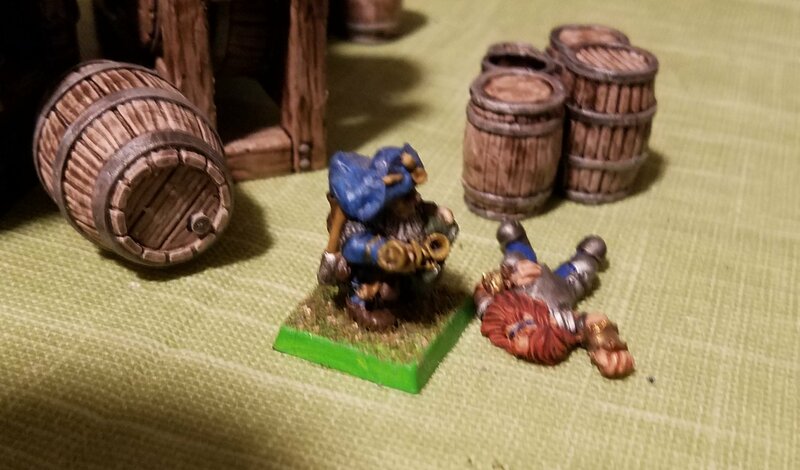 Thorek Silverthumbs (Rogue) a Dwarf smuggler who joined the band to investigate his clan's disappearance. Ajaxxus Skiotho (Savage) a Tiefling former hermit who has fallen under a berserker curse and joined the team guided by strange visions. 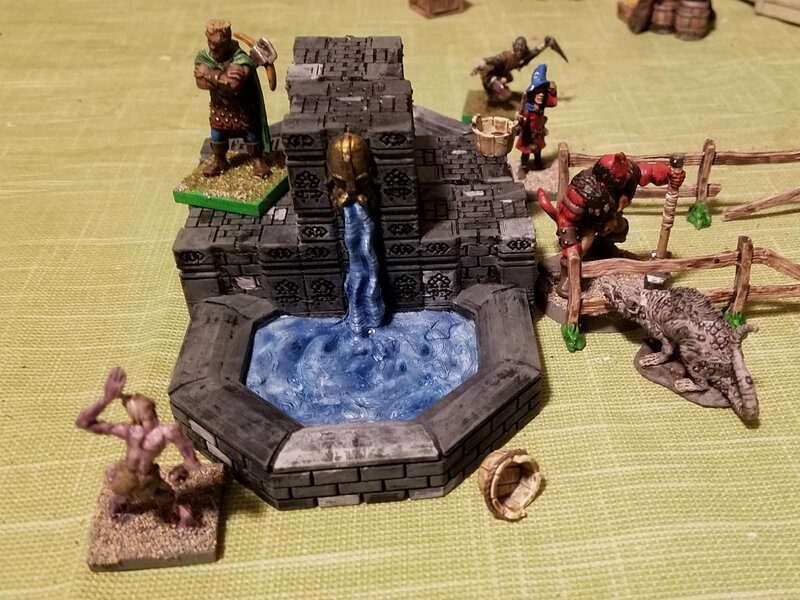 The party begins their investigation at the fountain at the center of the village. Cormac and Hershel go to exterminate the giant rats in the Dwarf Outpost. The companions quickly get swarmed at the fountain. Hershel is taken out quickly by a partial building collapse. Even Dwarven Architecture can't withstand the unknown forces of the Shadow Deep. Thorek finds odd tracks but can't quite figure out what they mean. The fountain crew is not doing well. Cormac continues to clear out the nasties lurking near the Dwarf Outpost. Mik decides to begin his trend of running away from danger. 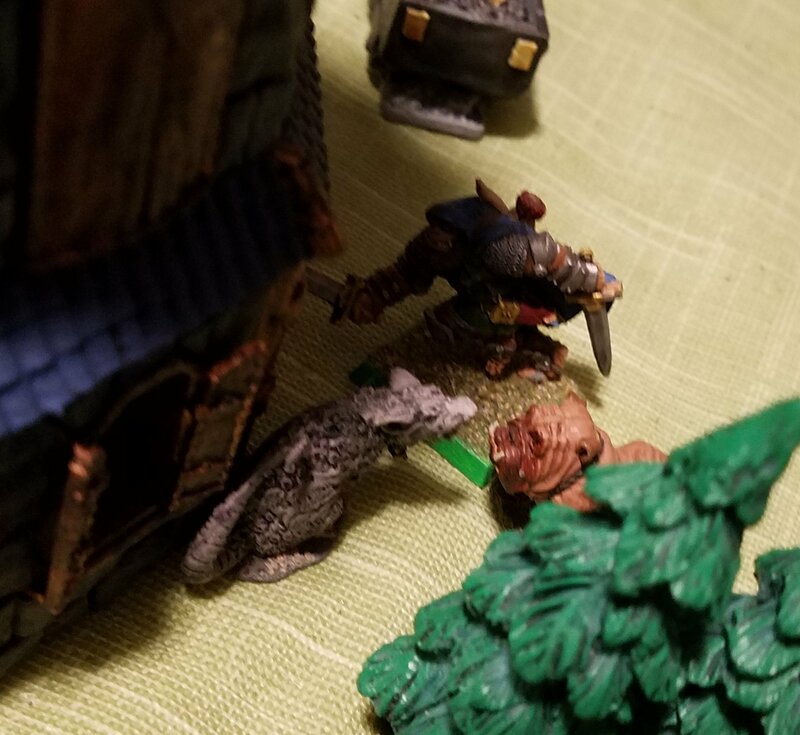 Thorek spots a "clue" near the ale stores. Ajaxxus remembers that civilized folks like people to knock on their door...slightly after using his sledge. 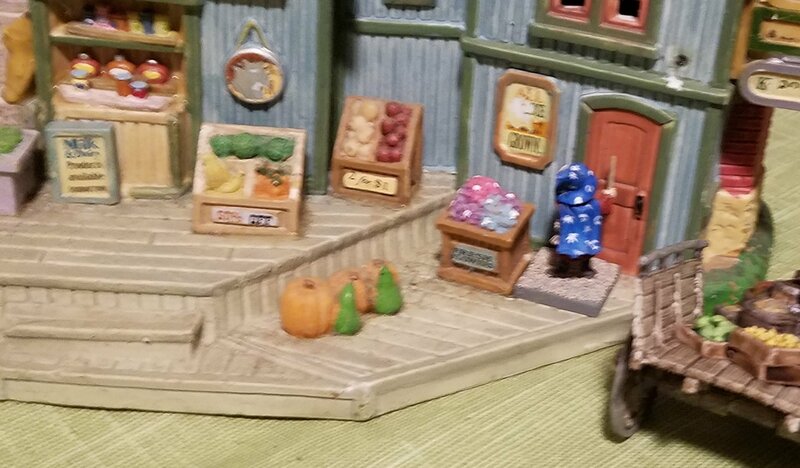 More undead are attracted to the village center. 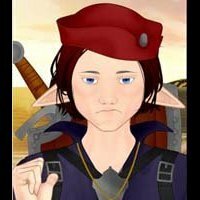 Ajaxxus convinces a Survivor to come out of hiding. The Survivor realizes Ajaxxus may have exaggerated how safe it was to leave. Mik realizes he ran the wrong way. 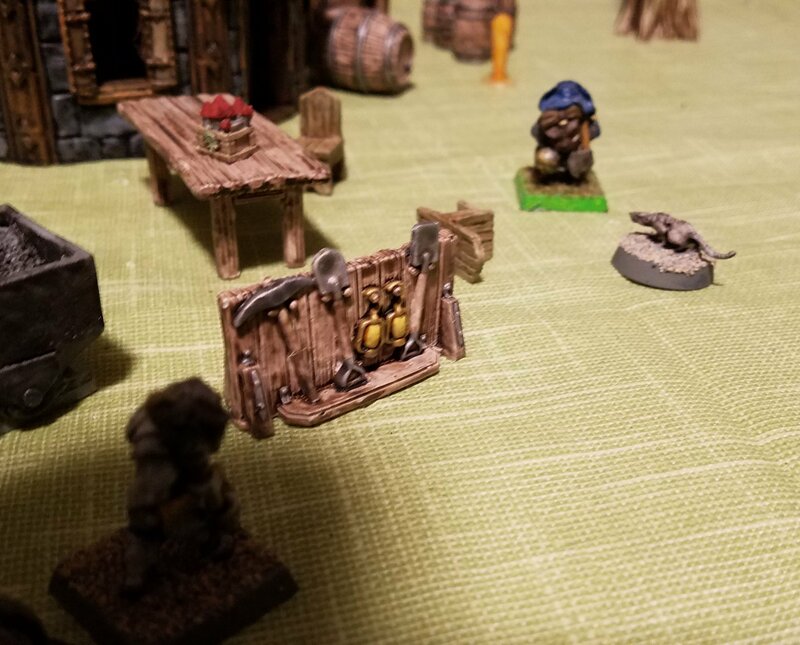 Thorek finds the remains of Ranger Aventine, stashed among the kegs. But even the mighty Savage is overwhelmed. 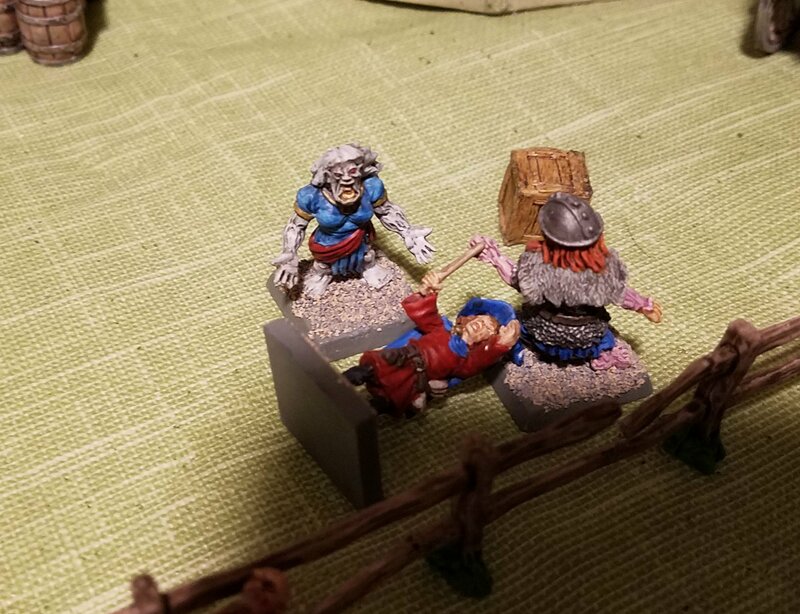 Cormac and Thorek pick off the zombies from a distance, before the expedition came to an end. 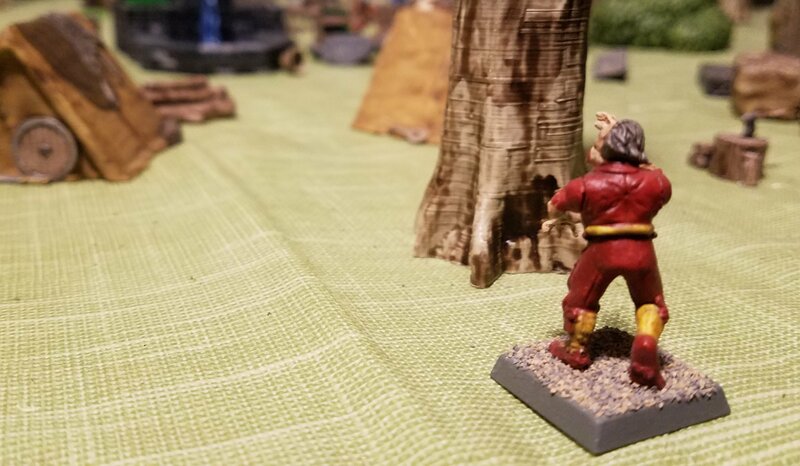 Having finally played, my review for Rangers of Shadow Deep is positive. It was a lot of fun, and I didn't know what to expect with the random Clues and Events tables. I wasn't expecting to only have two of my original team still standing at the end! Thankfully, they all survived, with only Ajaxxus suffering a Smashed Arm. Hopefully they'll be luckier when they follow the strange tracks they found. 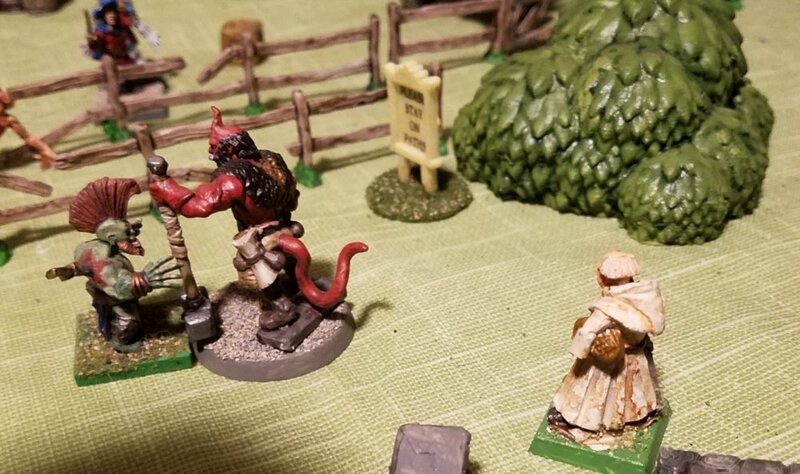 Love reading other people's battle reports for Shadowdeep and seeing their stuff. Everything looks great. Some missions it's a good thing the actual death rates are much lower than knocked out in game. Getting closer every day to starting the Burning Light campaign and hoping I can take some nice pics while we're playing. I've put a lot of effort into getting it all ready and want to show it off. Yeah, I really love the bright and cartoony world you've built. 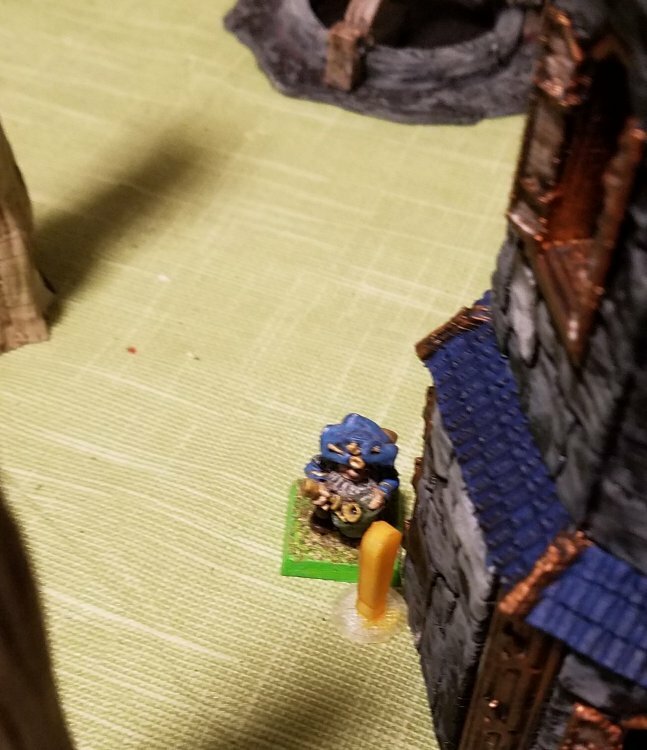 My son and I have been on a journey over the last nine months to play a campaign of Gorkamorka. Why so long you ask? Well, we decided that we really wanted to do it right and build terrain and mobs and vehicles from scratch. Sure we could have just played with some of the terrain I already had and lord knows I have enough orks to play a game, or thirty, of gomo but we wanted something to do together. 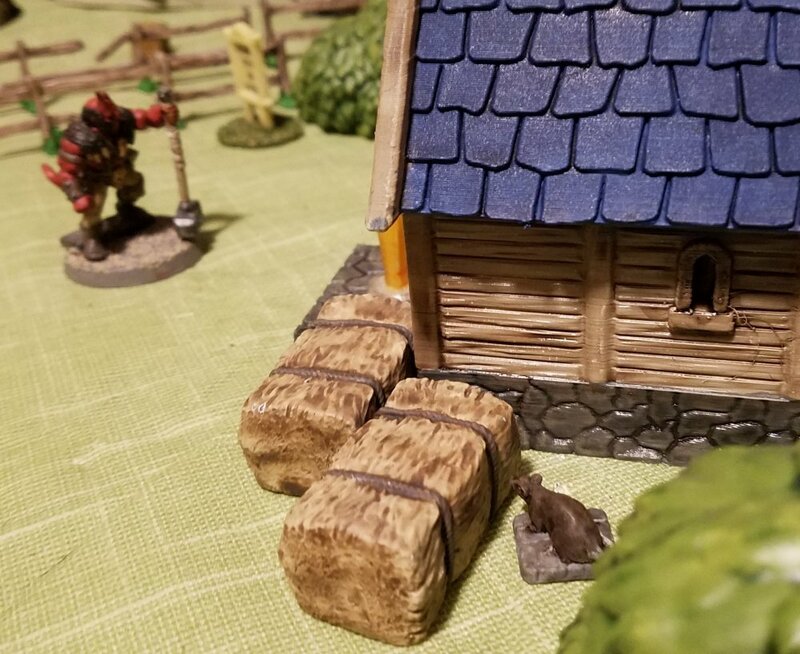 We started by building a massive amount of terrain, WAY more than we could ever use on even four tables of gomo but we wanted variety and versatility. That thread can be found here, very pic heavy. 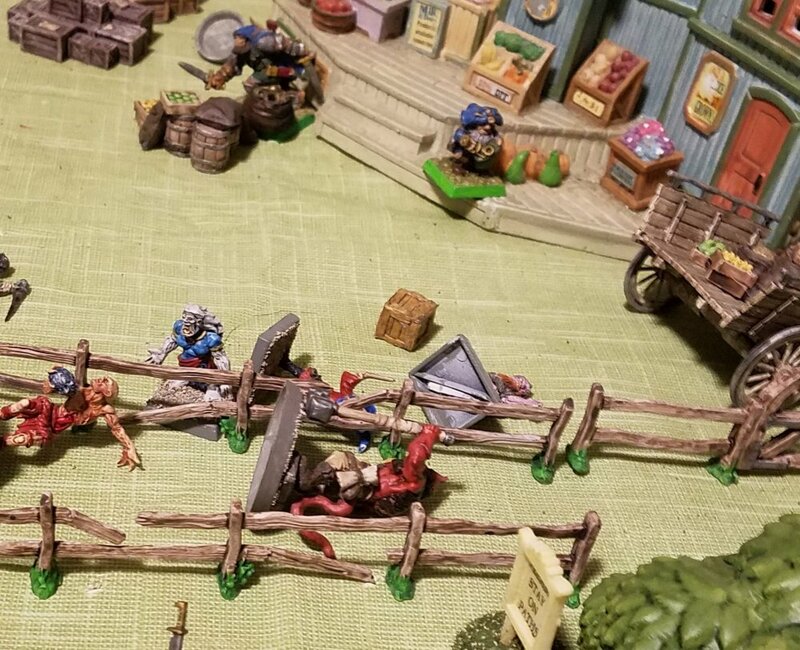 After that was finished we started building mobs and playing games to get the rules down before we really start our campaign with our gaming group. I have been starting project logs for a few of them, here are the Diggas where I built their trukk and the mob itself. I have started painting them here but had to briefly put them on hold to build another mob for a test game coming up soon. That trukk and mob build can be found here, they are the Goffs and they are proud of it. This is probably our twelfth game or so, we are really starting to get the rules down and games are much quicker than our first couple. It had been a solid twelve or more years since I had played a game but once we started most of the rules came right back. This game took us less than an hour total, that was from table set up to post game book keeping. Granted this was a very quick and non bloody game so that helped quite a bit. The dessert spread out far and wide before Gorbad and crew as they hurtled across the sand in their brand new trukk, it had only been crashed once before the meks sold it to him for only twenty teef. Pretty good deal since the mek had originally said he couldn't sell it for less than twenty-two. Gorbad smiled to himself, he had some hagglin' skills to rival a Deathskull, that was for sure. Sweat rolled into his eyes causing him to snap back to the moment as he wiped the sting from his eyes and the sand from his face. Overhead the sun beat down as relentlessly as ever, it was early day but the temp was already climbing to almost unbearable even for an ork such as himself. There was never a moment of respite on this world he thought. All the hardship,fighting and scraping was good for his lads though, gave them something to do and kept the yoofs out of trouble. Gorbad was snapped back to reality again as Grimgut, the new spanner and driver of the new trukk, was screaming something that he couldn't hear over the roar of the centrally mounted engine. Grimgut was now frantically pointing in the direction they were headed. Before Gorbad could turn to see what was out there Snazbad, the new yoof of the mob, was frantically tugging on his arm. "Wat!?!" bellowed Gorbad at the light green yoof. "Boss, I seez somethin'! ", Snazbad was also pointing in the direction they were headed. Sneering at the yoof but holding off from smackin' him across the back of his skull for fear of finding a soft spot Gorbad was finally able to turn his attention to the desert in front of them. A large ramp down into the skid could be seen and right at the bottom of it, some no good stinkin' Freebootas! A smile crept onto Gorbad's face, "Hit the Red Button! he screamed at Grimgut. The trukk bounced across the rough desert ground and all the boyz roared in their excitement. Those git Freebootas was caught out in da desert diggin' scrap like a bunch a grots thought Gorbad, his smile gettin' bigger, and more full of sand by the second. The thunderous roar of his new trukk and boyz musta scared them no good Freebootas, before Gorbad and 'is boyz could get to 'em and give 'em a good whoopin' they was in they trukk and tryin' ta get away. Their good for nothin' bad mek was behind the controls of the vehicle and hittin' the Big Red Button before he even had the gas engine started! Their vehicle lurched ahead straight toward The Last Rock forcing their mek to slam on the breaks. 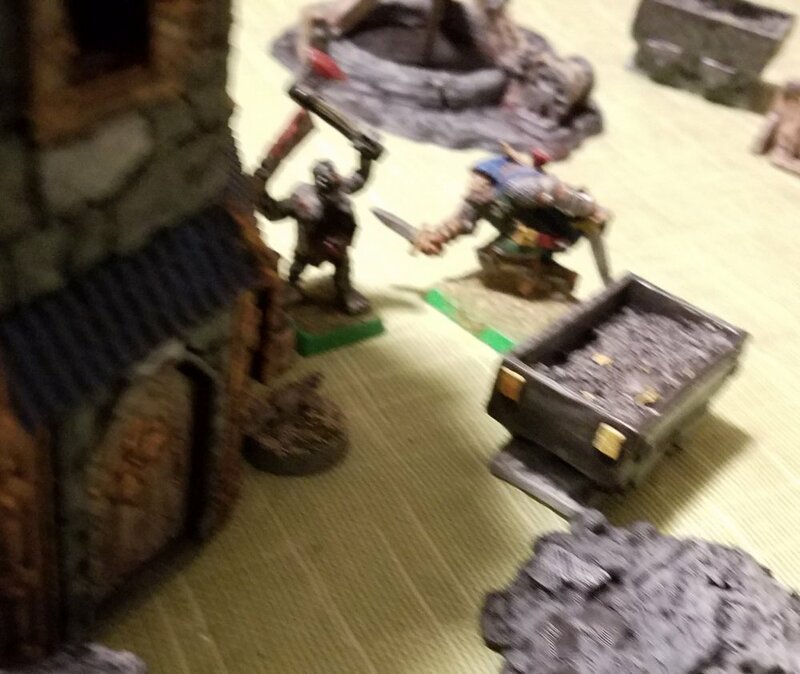 Gorbad was yellin' for Grimgut to t-bone them but somehow over the roar of the engine his message was lost and the new spanner skid stopped the trukk sideways, headed straight for the side of the cliff. Both mobs crammed to the sides of their trukks facing the other mob and let loose with every ranged weapon they could bring to bare. The bad mek, still without his gas engine started, was smooshing the Big Red Button nonstop! In an amazing turn of luck all this accomplished was that the low ridin' git wagon spun 'round and faced almost straight at the center of a large dune of soft sand. 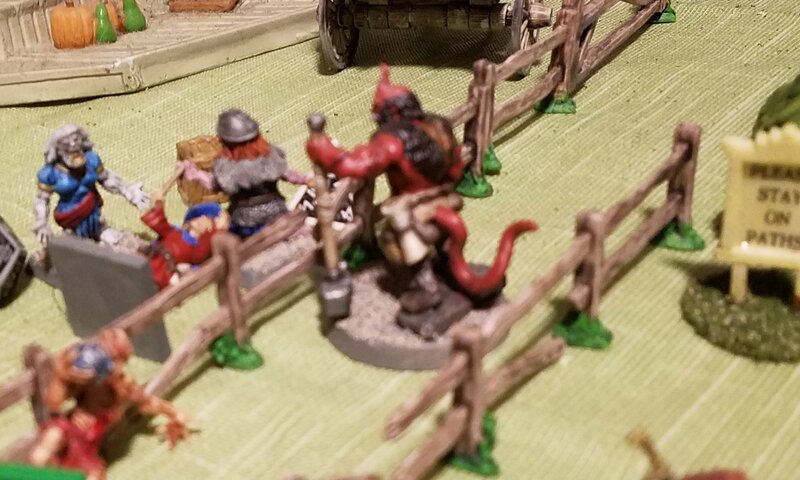 Gorbad saw that this was the moment he needed and once again he yelled for Grimgut to ram the stinkin' Freebootas while they were in a bad position. The spanner must have heard this time as he skillfully turned the new trukk 'round the right way and Gorbad could hear the thrusters begin to whine up, the vehicle lurched forward and then stopped. Gorbad, once again, whirled to see what the new spanner was doin' only to see him pulling out a hammer and beatin' on the Red Button....he must not be strong enough to push it he thought. He ducked just in time as he saw Zogstruk, the new gunner of the new trukk, fire the harpoon gun at the enemy. He wrenched his head around just in time to see the massive harpoon glance off the engine and stick in the sand. Then the roar of weapon fire was deafening as once more both mobs opened fire with everything they could. Gorbad's heart jumped in his chest as he saw the Kaptin' fall face first from their low ridin' trukk. His joy didn't last any longer than a few quick heartbeats as the tough old git crawled back into da trukk, the bad mek started his gas engine and tore off across the desert, followed by blasts from their thrusters taking them almost out of range to even think about chasing after them. Gorbad screamed at Grimgut to give her everything she had and catch up to them before they were too far away. The spanner revved the gas engine, threw it into gear, spun the vehicle around to give chase and mashed the Red Button only to loose control and skid to a stop facing the cliff and a tank trap. Needless to say, I(Gorbad and the goffs) did not win this one. My son did exactly what he had to do to win, get off the table with the most scrap, and win he did. It was a fun, funny, orky game, full of awesomely horrible dice rolls for both of us. However, in a game like this sometimes that will actually make for a much more entertaining game. Gorbad, his back against the side of the armored crew compartment, slid down until his bottom was on the bed of his new trukk. He began fumblin' through his cigar pouch searching for the only thing that may help him feel a little better about his life choices at the moment. At last he found it, the last stump of his last cigar. He brought it to his mouth and began searchin' for his lighter in his chest pocket. He found it, quickly pulled it out, struck it and nothing happened. Gorbad looked at the heavy, metal lighter and saw that it had caught a bullet, at least he could rely on someone in his mob he thought before he roared and threw it at Snazbad, hitting him behind his right ear. The yoof crumpled like a grot under a slavers whip. Gorbad and the other boyz roared in laughter. This is from the last game that I played against my son. Both of us are sporting lvl 7 wizards, he an Elementalist, I an Illusionist. 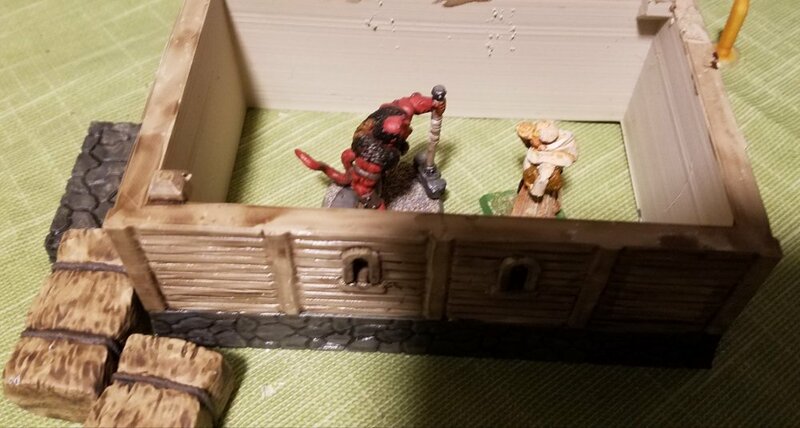 We rolled randomly for a scenario and got The Mausoleum. 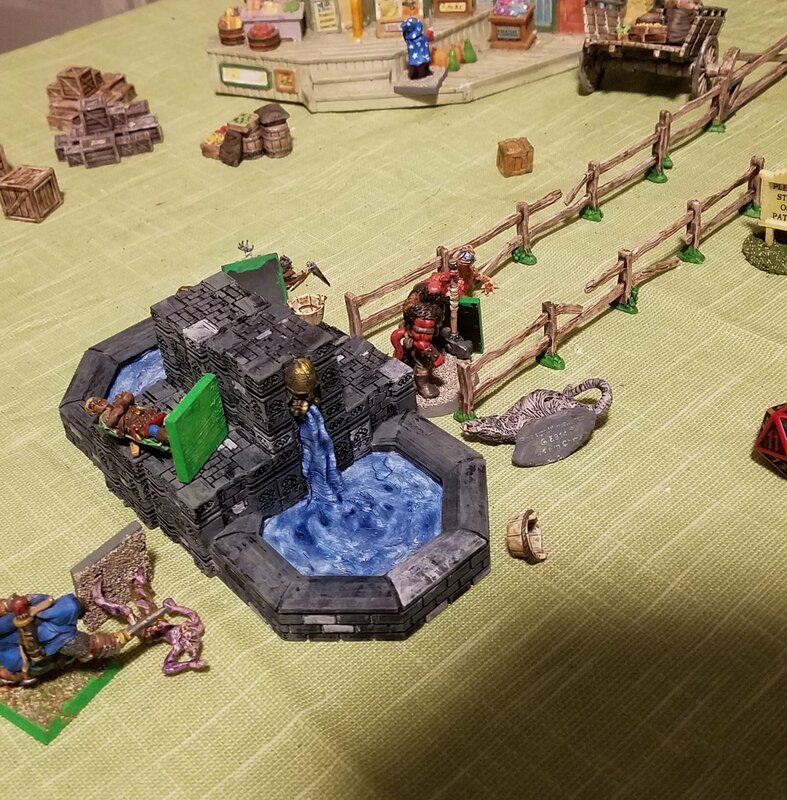 Set up terrain, placed treasure tokens, rolled for sides. 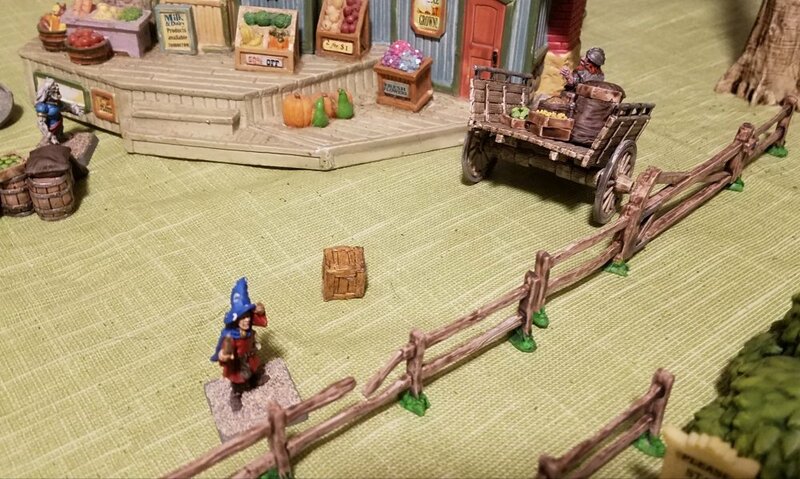 Pics of the terrain layout. His left flank, A large construct, a halfling thief and his apprentice and a thief. 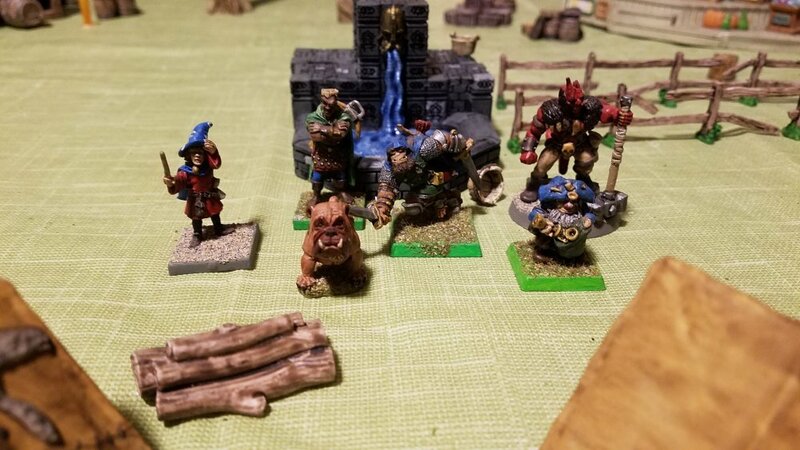 His center, an elf archer on the ruins, a hyena, a medium construct, an orc barbarian named "pokey", his wizard, a thief and a goblin thug(which has gained quite a reputation for being a badass). 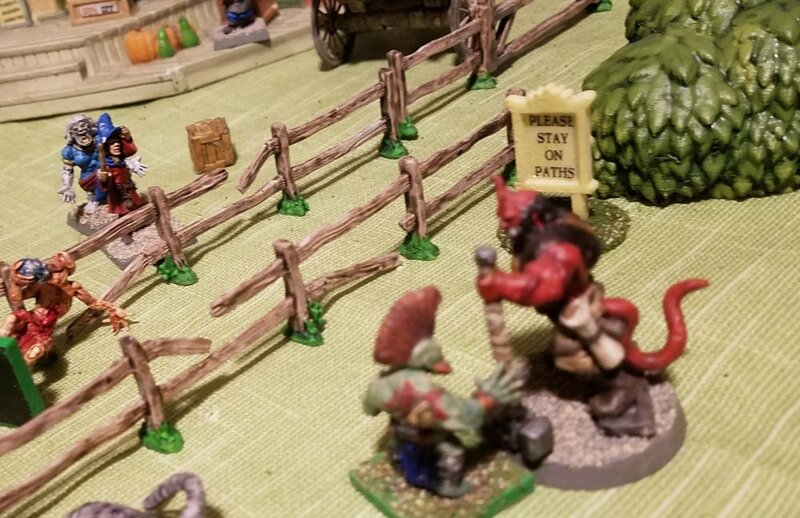 My left flank, a trained attack lizard, a marksman, my apprentice and a pirate thug just hired on before this trek into the city. My center, my Illusionist, a thief and a barbarian. 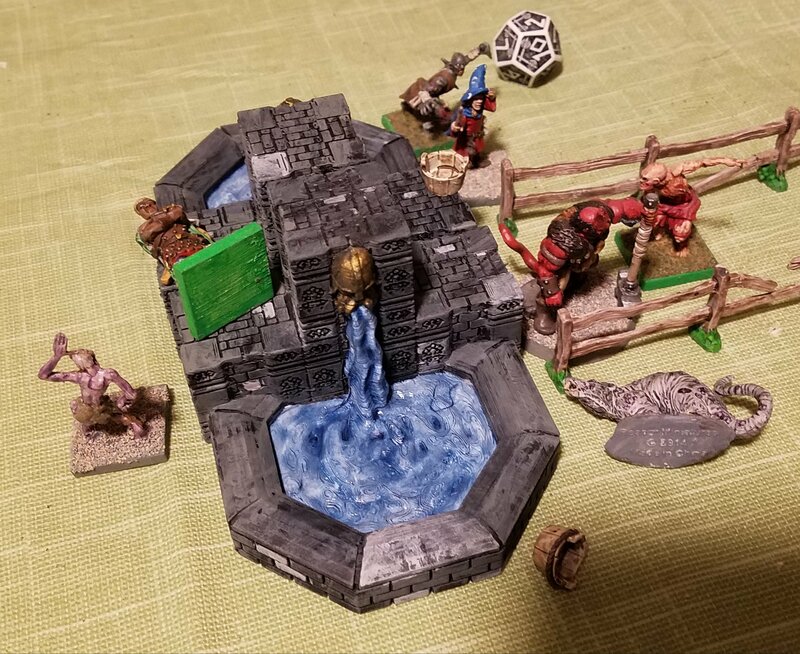 My right flank, a marksman inside the ruined house on the second floor, an infantryman, my captain and a thug. My son wins initiative, we go through most of our phases with nothing really that important or exciting happening. 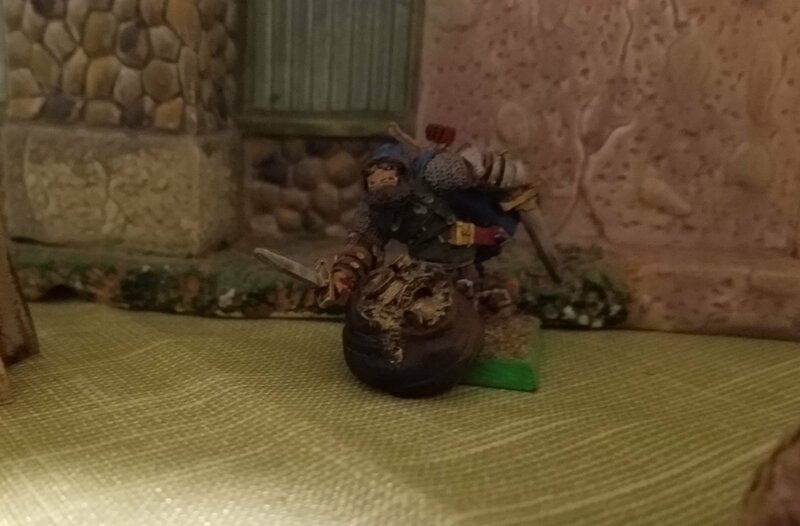 People getting into position, taking up firing spots, moving closer to treasue....oh, your elven thief is going to pick up a treasure already, okay....cool. 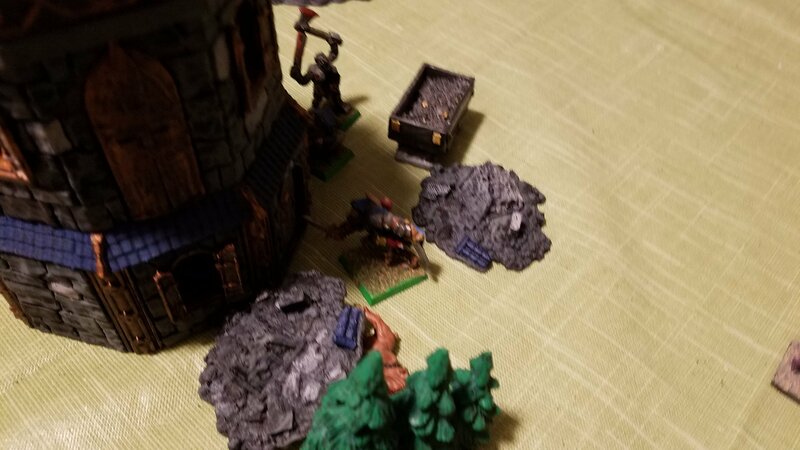 Still his turn, he has his elven archer that moves up the steps on the ruin in his center and finds a window to shoot from. ...yes you can, go for it. My son picks up his "lucky" blue d20 and rolls it, I throw a random die into the box, My son yells "CRIT!" before my die even stops rolling. One dead snow troll. SWEET! 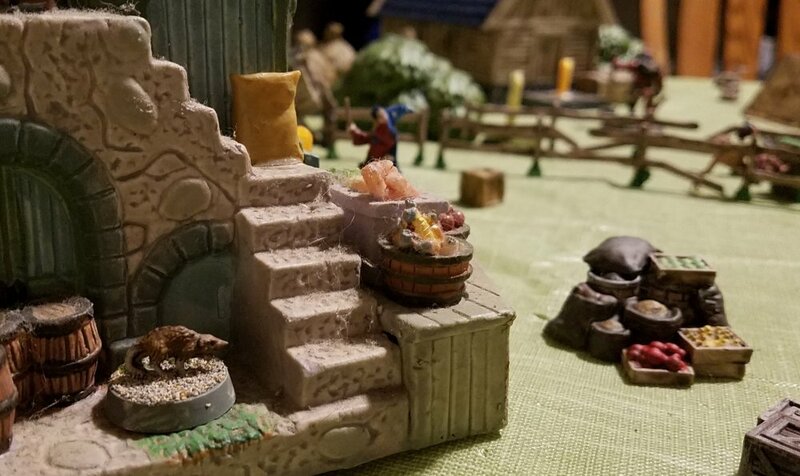 My son used leap to kill a few of my people and to get his treasure tokens off the board pretty quickly. 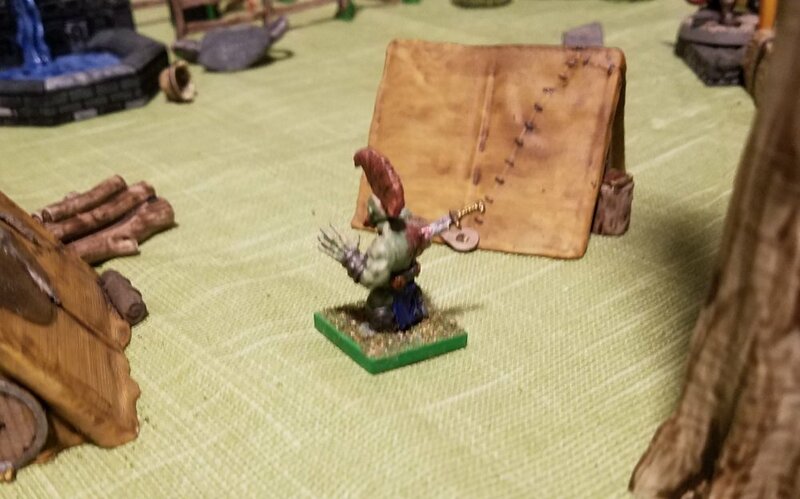 My sons goblin thug managed to swing all the way over to my side of the board, killed my warlizard and my marksman before scurrying back into safety on his side of the table! WTF!?! That little guy is dangerous and someone needs to take him out! In the end I managed to get four treasure tokens off the board, my son got two. It was a good game but by the end I was almost to the point of rage quitting because of the leap spell that was being used incorrectly(we did not know this at the time). My treasures turned out to be mostly mundane with the exception of a grimoire, my son got scrolls and a grimoire. 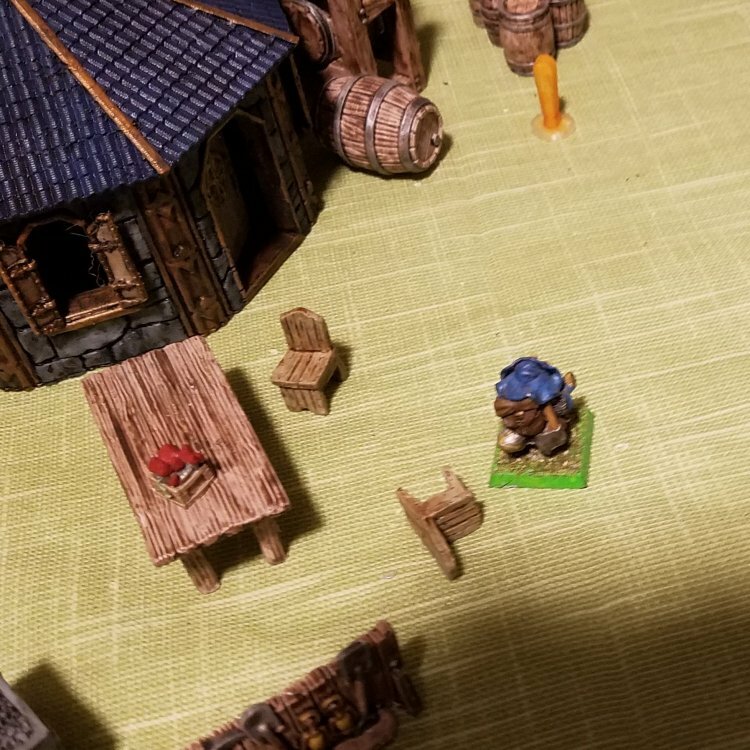 No one died in my warband but a few are missing the next game, my captain being one of them. My son lost no one either but his hyena will miss the next game, just going to get a new one he said. That's it folks, just a little short one. All in all a good game. I pulled out my VSF stuff last night for the first time in a while. Several weeks ago Sentinel contacted me and said he would be in town and asked if we would show him how to play Warlord. Last night my husband and I dragged our armies over to the FLGS and set up a couple quick 500 pt games to show him the ropes. The Supers began by charging across the field, using the ruins as cover. At that distance they were pretty safe from the mostly-infantry Nefsokar. Hulk meets a line of herdsmen lead by Kadath, with the giant scorpion closing in. Meanwhile the dust devil closes in in an act of mutually assured destruction. Nebnesew takes a line of mummies into the fray, quickly backed up by a chorus of summoned Spectral Minions. Things began to look grim, but in the last round the snipers moved into range, aided by the magician Harry Dresden, and finished off Netikerti and her minions. And that was only the first half of the evening!